San Jose, Costa Rica, sometimes referred to as the San Diego of Central America for its friendly, laid-back residents. San Jose, Costa Rica, is sometimes referred to as the California of Central America. That’s either a compliment or an insult, depending upon your political bent. I made perhaps a dozen trips through San Jose when I was delivering airplanes regularly to points farther south. Many of these deliveries were crop dusters destined to help suppress coca production. We could usually tell which airplanes were intended to kill coca plants by the armor plating surrounding the pilot. I was happy I was only delivering them and not flying them above the cocoa fields. It was the third day of my trip south and a welcome day off. The weather in the Gulf of Panama was growling and blowing, and the winds were on the nose instead of the tail. That was a welcome rest since San Jose, Costa Rica, is a favorite stop. Santamaria International is Costa Rica’s largest airport, and despite the common image of Central America as a collection of third-world countries with unpaved streets, fragile economies, populations in poverty and unrestrained dictators, much of Costa Rica is more reminiscent of San Diego or San Antonio than a Latin American city. San Jose is a successful tourist destination (again, you can judge if that’s good or bad news), with luxury hotels and all the amenities of the U.S., plus a flavor closer to San Antonio than Havana. 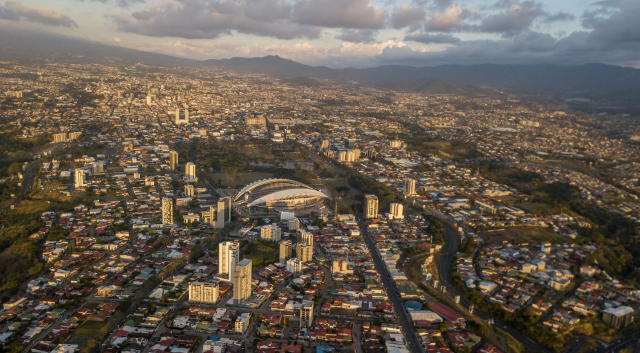 Costa Rica has little in the way of military assets, but it‘s home to one of the largest police forces in the region, so the streets are relatively safe. In addition, it boasts many of the accoutrements of the Golden State. There are Starbucks or McDonald’s, Red Lobsters, Black Angus or Outback restaurants everywhere; Holiday Inns, Hiltons or Sheraton Hotels scattered throughout San Jose; and airline service to pretty much wherever you wish to fly. Translation: It’s one of the most modern and safest cities/countries in Central America. My previous dozen visits had only been for overnight rest, then, on to South America. This time, I got to enjoy San Jose. Neuquén province in Argentina is 6,000 miles from Van Horn, Texas, a long way to fly in a Piper Brave 400 crop duster but a spectacular destination all the same. 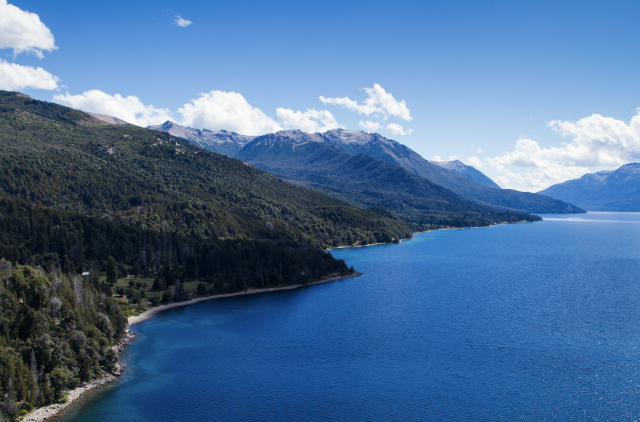 This trip was headed to Neuquén, Argentina, to the far south in the Patagonian Desert. My ride was a Piper Brave 400, a two-and-a-half-ton, conventional-gear crop duster, the largest Piper bug-bomber ever built. This airplane was fully equipped, at least, as fully equipped as you can make it. There was a big, beautiful joystick rising from the floor to center cockpit (just where God intended it to be), a single seat mounted near the wing trailing edge, no autopilot, no anti-ice, few avionics, a fairly Spartan panel and an almost military cockpit, mounted directly behind the 275-gallon hopper. The Brave 400 was a pure, no-frills airplane. Far out front, the total package flies behind one of the largest, horizontally opposed general-aviation piston engines ever built, a behemoth eight-cylinder Lycoming IO-720, essentially a pair of IO-360s welded together. Collectively, they produce a thundering 400 hp. I departed West Texas Aviation in Van Horn, Texas, two days before, stopped in Tapachula, Mexico, hard by the Guatemala border, for the first overnight; then, continued on to San Jose. My next destination was 1,000 miles across the usually benign Gulf of Panama to Guayaquil, Ecuador. Shortly after takeoff, I had the Brave 400 trimmed for cruise and sensed a slight murmur in the airplane. I adjusted the mixture, trying to smooth things out, but suddenly, the murmur became a fast, regular vibration, shaking the stick in my hand and causing the entire aircraft to stutter with a regular roughness. Of course, I thought. I looked to my left and noted that the spray booms, mounted to the wing-trailing edges, were shaking so violently, they’d become a blur. Every crop duster pilot knows this, along with some ferry pilots. Now I’m one of the latter group. I eased back on the power by a half-inch, and the vibration dampened to nothing, like turning off a light switch. The spray booms were still once more. Thank you, Lt. Commander Lyle Shelton, USN. My transit across the Gulf of Panama went off without incident. As I passed the coast of northern Ecuador, the sun set over the Pacific, and I went feet dry once again with the glow of Guayaquil’s city lights starting to emerge from the blackness of northern South America straight ahead. Quito, Ecuador. 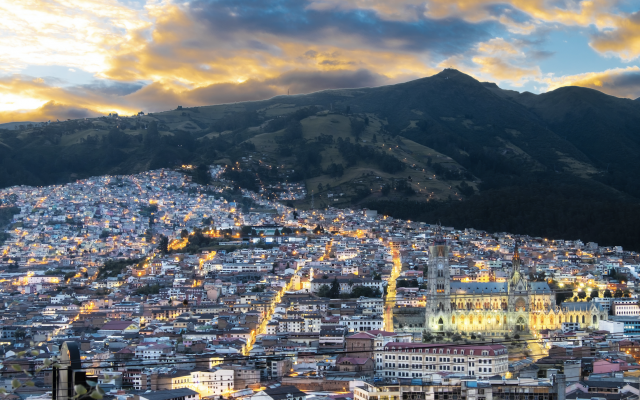 Quito, the capital of Ecuador, is located just inland behind the northern tip of the Andes.Its airport lies at 9,300 feet MSL. Off to my left, I could also see another glow of city lights behind a distant ridgeline of mountains, this one from Quito, the capital of Ecuador. Quito’s airport lies at 9,300 feet MSL, just inland behind the northern tip of the Andes, the longest mountain range in the world and the second highest. I vowed that someday, when I was flying something fast and pressurized, I would visit Quito. As I began my descent into Guayaquil, I remembered its chamber of commerce nickname, Gateway to the Galapagos. Several years back, I ferried a new Piper Mirage to Guayaquil for an Ecuadoran businessman who owned an import/export business in the city. Two years later, he called and said he was interested in buying a Piper Super Cub and having it ferried to the Galapagos Islands, far off the Pacific coast. I was enthusiastic about seeing Galapagos—it’s always been on my bucket list—but trouble was, the islands are about 630 nm west of Guayaquil, and the Cub had only a 36-gallon fuel tank. Even if you strapped a 30-gallon neoprene tank into the back seat, you’d have only 66 gallons total. A Super Cub can cruise at about 95 knots on 9.0 gallons per hour. That works out to 6.3 hours of total endurance, worth barely 600 nm in any wind conditions. I advised him to have the Cub disassembled and shipped, and he called me a month later and told me that’s what he finally did. The Piper Super Cub now lived in the Galapagos. The Brave 400 had no such range problems for the trip to Neuquén. The airplane’s wing tanks held 86 gallons, but the 275-gallon hopper out front had a simple selector valve hat that allowed it to feed either of the spray booms. If you weren’t carrying applicant in that tank, you could clean it out and pour in avgas. At 21 gph, the thirsty Brave gave me an instant 16 hours of fuel, worth 1,900 nm at 120 knots. That allowed me to overfly Peru, with its expensive fuel and landing fees, and land at Arica, Chile, 6 miles inside the Chilean/Peru border on the northern edge of the Atacama Desert. The Atacama has the curse/distinction of being one of the driest places on Earth. Some parts of the Atacama have never seen rain in recorded history. Weather is nearly always severe and clear in this part of South America. The next morning, I was out of Arica for Santiago, Chile’s capitol. Navigating south couldn’t have been much easier in those days before GPS. Simply keep the ocean on the right and the 20,000-foot Andes on the left. There were radio navaids available in some places, but many of them were out of service, and others had limited range. The farther south you fly along the Pacific coast of South America, the better the weather, so real IFR is rarely necessary, a good thing in my case, as the Brave 400 wasn’t exactly replete with radios. The huge Nazca geoglyphs of the Atacama Desert. Different glyphs depict birds, plants and animals. Many can only be seen in full from the air. There are some 700 of the ancient pictographs scattered across the Atacama Desert. As I ticked off the miles at a leisurely 2 per minute in the direction of Cape Horn, I couldn’t help but notice the famous lines of Nazca, gigantic geoglyphs of birds, plants and animals covering the entire sides of mountains in southern Peru. There are some 700 of these scattered across the Atacama Desert. They’re so large that they can only be seen from the air. 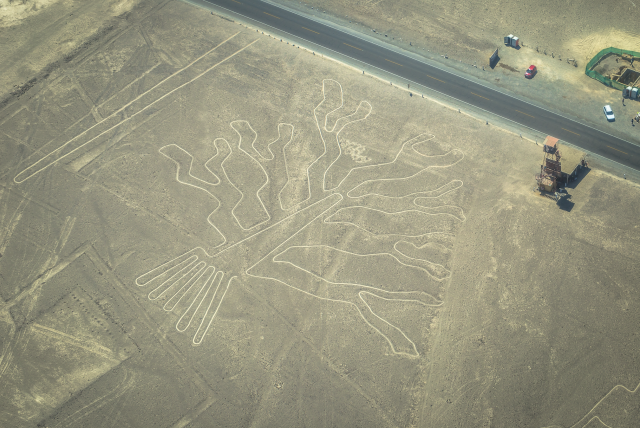 For that reason, some believe the Nazca people created them to honor aliens who supposedly visited Earth long ago, a theory popularized in the 1960s by author Erich Von Daniken. Flying straight south out of Arica, Chile‘s western border stretches 4,000 miles to Cape Horn, with Santiago in the middle. The country is only about 80 miles wide at its northern border with Peru. Santiago is about a third of the way south, a picturesque Latin city replete with stone men waving stone swords and riding stone horses in the city square and historical monuments to Chile’s glory days. The crest of the Andes Mountains ridgeline forms the border between Chile and Argentina. It is the most perilous part of the journey for small planes. Santiago is also where the Pan American highway turns east away from the coast and begins the long climb toward Argentina. I’ve passed this way perhaps a dozen times before, and the highway leads you straight up from near sea level to the angular Andes. I climbed east, following the snake-like highway winding through the foothills and, eventually, the mountains themselves. The Pan American Highway winds slowly toward a tunnel at the 8,000-foot level and emerges on the other side of the ridge in Argentina. I steered toward the lowest crest in the ridge above the tunnel. 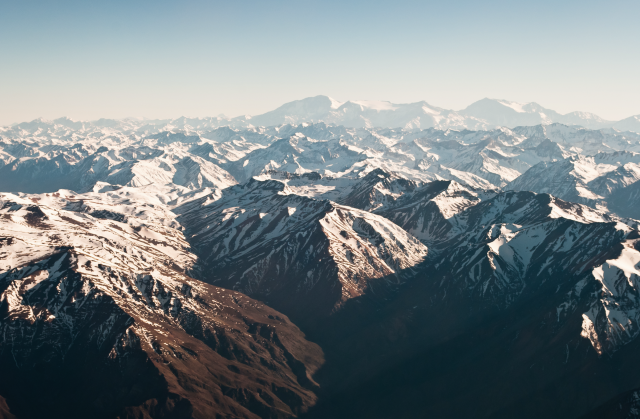 South America’s tallest mountain, Cerro Aconcagua, was to my left, and the second-tallest, Cerro Tupungato, knifed the sky to my right, both reaching to about 23,000 feet. The Pan American highway threaded its way inside the rocks between the two monster peaks into Argentina, and that’s where I headed to cross over from Chile. The crest line between the two countries forms the border, but the resulting ridge only drops to about 12,000 feet at its lowest point. Piston-powered crop dusters were never intended to fly that high, and the heavily loaded Brave 400 struggled to surmount such tall terrain. Flying directly between the two tallest mountains in the Western Hemisphere is a humbling experience if you don’t have the benefit of a turbocharger. Fortunately, I spotted a giant condor circling in the thermals near the crest line, and I followed his lead, ascending at 250-300 fpm until I cleared the ridge into Argentina. Once past the Andes, I found the hop down to Neuquén across the Patagonia Desert was an easy 600 nm. When I handed the paperwork to the government agent in Neuquén, I couldn’t help but reflect that the Brave 400 had been a good ride. Then all I had to do was figure some way to arrange a ferry to the Galapagos Islands. 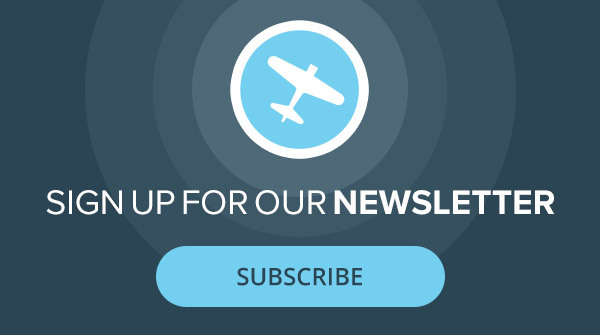 Check out more Cross-Country Log flying storiesfrom ferry pilot and Senior Editor Bill Cox.